Once you earn your bachelor’s degree in education, the next step will be to specialize a Master’s in Education degree so that you can advance your teaching career. Earning your undergraduate degree may qualify you to test for your teaching credential, so that you can take on your own class. However, even though you are qualified to teach, it does not mean you do not need to understand the importance of continuing your education and becoming a specialist. Earning your graduate degree will give you a competitive advantage when you are looking for new jobs or even a promotion. Read on, and find out what you will need to know to choose the best area of specialization for you. The very first step to specializing your Master’s in Education degree is to decide what type of setting you would like to work in for the long haul. You are not obligated to work in only the area that you specialize in, but taking a degree program with a content concentration in a particular area of Education will make you a specialist rather than just a generalist. Some of the different settings that you may want to work in will include: Early Childhood Education, Elementary Education, or Secondary Education with a focus on specific subject areas. Once you are set on a setting, you should then consider what you would like to do as an expert educator. If you would like to be part of the curriculum development process, choosing a Curriculum and Instruction specialization would be well-suited for you. If you would like to work with students who speak a foreign language or with students who are struggling with literacy, you are best suited to study Bilingual Education or Language and Literacy Education. Some other popular options that you may have never considered include: Technology in Education, Sports Management, Urban Education and Social Thought. There are several different reasons why educators will choose to spend an extra two to three years pursuing a master’s degree. One of the major benefits of choosing a concentration is that you will be able to use the new knowledge to provide a greater context to your students. They will then take away what they are learn and be able to apply it later in life. Another reason to spend the time dedicated to studies, is because you can raise your earning potential and qualify for roles at colleges and universities. If you would prefer to stay in a primary or secondary setting, earning your Master’s in Education will help protect your job and qualify you as an expert who is prepared for leadership roles where you can take on more responsibility, according to USC Rossier Online. 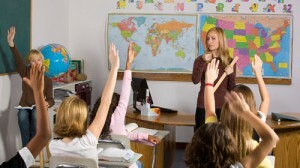 There is a rising demand for all teachers, but especially for teachers who have a master’s degree. It can definitely be beneficial to look for areas where there is the greatest shortage of expert educators and the regions where you will have the best stability. Look for specialization areas where there is rapid growth and continued projected growth and then you will be ready to decide how to specialize a Master’s in Education degree.